Great Choice For DIY Gifts. Need a Halloween, Christmas decorations gifts or birthday gifts? Make your own DIY gift with our fur pom pom. ⛄Package Size : 6" x10" x 1"
1. Due to the light and screen difference, the color may be slightly different from the pictures. Please understand. ☝MATERIAL. 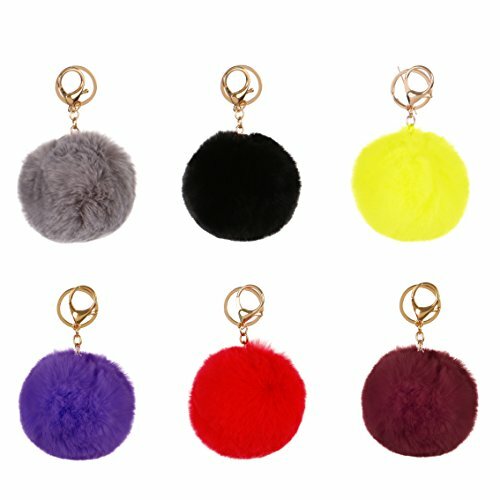 best quality faux fur with good quality keyring. Attention: the keyring is same as the photo showd, please check all left side photo. ball approx diameter 3.5-4 in. ☝FASHION FURRY POMPOM FUR ACCESSORIES. Remind: please shake the pom pom when you get it, or you will feel the pom is not fluffy due to long time shipping squeeze. Although we have send it to you by box, still squeezed a little. We could guarantee our quality, we are imitated fox fur, not real fox fur, our price is much lower and our quality is high imitated fox fur. No killing to animal, friendly to animal. ☝ PERFECT GIFT. It's the perfect gift for yourself or someone special. It's a good accessory also especially your beloved bag and keychain. Need a Halloween, Christmas decorations gifts or birthday gifts? Make your own DIY gift with our fur pom pom. ☝RufNTop : Here at Top Level, We Strive to Maintain the Highest Quality Standards and Your Satisfaction is Our No 1 Priority. Quality in Fashion Products, Low Pricing, Quick Delivery, and World Class Customer Service Result in Happy Customers. If you have any Questions or Problems about Our Service or Product Quality or Other Matter, Please Contact Us Timely before Leave Negative Feedback or Reviews, Give Us a Chance to Improve Your Shopping Experience. If you have any questions about this product by RufnTop, contact us by completing and submitting the form below. If you are looking for a specif part number, please include it with your message.